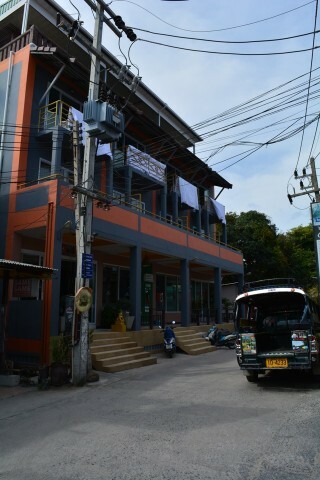 Set pretty much in the centre of Haad Rin village, Nap Inn offers smart and functional rooms in a modern multi-storey building at a reasonable pricepoint for the standard. Average rating 8.9 from 22 reviews. There’s no swimming pool, you’ll need to head elsewhere for that (we suggest the ocean), but there is a rooftop astroturfed lounge-around area, which includes a Jacuzzi, gym and a couple of bright purple deckchairs. Yes really. It was dead when we took a look (even the Jacuzzi was empty) but our guide explained that close to full moon, it was very popular. Closer to earth, rooms are very clean, with verandas (little to any water view) hot water bathrooms, firm beds with white linen a decorative pillow or two, bed lamps and towels thankfully not contorted into swan shapes. There’s a bit of art on the wall, minibar, free WiFi and that about rounds out what is on offer. There is no real restaurant on site, but Nap Inn is very centrally located so there are plenty of places to eat close by. As with many places on Haad Rin, rates skyrocket over Full Moon, but across the saner remainder of the month, rates are not unreasonable – though to be honest, we’d prefer to stay in an air-con bunglaow on the sunset side for the same money. That said, if you want a solid crashpad close to the party, then Nap Inn is a good shot, just book early as it fills up fast. A good second option (with a pool) is Delight Resort not far from here. If you want something larger and with a pool, take a look at Haad Rin’s primary eyesore, Drop Inn Resort, or, if you have industrial strength earphones, consider V2 Seagate right down on the beach. Check rates at Nap Inn on Booking.com.